The support staff, catering to those wishing to try surfing and other outdoors activities, stayed on trying to build on the collapsed ruins of the busted resort. During the surf craze that bit the nation in the 1950’s and 60’s, the small community flourished, as beach bums drove their VW Buses up and down the California coast looking for the perfect breakers. 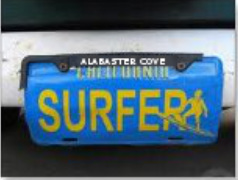 Eventually they created a formal city and established themselves as the hidden surfing capital of the western coast. The city’s primary source of external income was the thousands of adventurers who flooded in to enjoy the year-round hiking, hang gliding, and parasailing. But its claim to fame was its amazingly diverse surfing. Die-hard fans who made the trek to California’s remotest town swore it had conditions unrivaled by any stretch of sand in the world. Alabaster Cove boasts ten short but amazingly diverse miles of coastline and is the only beach in the world with mile markers. Originally the residents posted signs listing degrees of difficulty at specific intervals of shoreline. But every self-proclaimed expert had a differing opinion, resulting in a slew of replacement signs, each listing the required skill set to safely surf each interval, new ones going up every year or so. The lack of consistency resulted in confusion for out-of-towners, hurting the very industry supplying the blood of the town’s economic health. Nothing in the history of The Cove is so controversial and draws the passion out of its people as the surfing of their little coastline. Eventually the bickering and controversy became so great, it was finally decided each surfer must decide for themselves if they can handle the conditions at any given point. So all the signs were yanked down replaced with the markers. A brochure was published describing the characteristics, but refrained from specifying the required skills except in the broadest of terms, for each area. As technology progressed the brochure was replaced with a web site giving up-to-the-minute surfing conditions, weather, so on and allowed users to log in and comment on particular stretches of beach. On the northern side of town the ocean floor rises gradually, making small, mellow waves perfect for beginners. For each mile south, the topography of the ocean floor changes with astonishing consistency, as the continental shelf becomes steeper and steeper. The five to seven miles at the center of town, by far the most popular stretch, has six to eight foot waves. A mile or so further “down the beach,” nine to twelve foot double overheads. Eventually leading to the most extreme portion of the coast. On the southernmost shore is a coral reef which ranges from up to 20 inches below the surface and creates stupendous, but unstable waves. The unique shape of the steeply sloped reef causes the very hollow waves to effectively break below the surface. Only the most skilled and physically fit dare attempt to surf these scalloped-shaped, semi-arching breakers, which are almost as thick at the lip as they are tall, as they race along the dry reef closeout. The measure of a surfer’s skills is referred to how “far down the beach” they can handle the conditions. Beginners are at the northernmost point, and after a few lessons can usually move a mile or two south. Within a few months most people can reach the five mile mark. The apex of the bell curve is right in the center, with only a few venturing to eight and nine. Unlike its famous-for-surfing northern counterparts from Malibu up the western coast to Washington, The Cove actually has a higher population in the winter as weather conditions near the equator remained constant throughout the year. North of the town during the summer months, crowds can find closer-to-home, more famous venues, with only the most dedicated finding their way to this isolated corner of the globe.